Huddersfield - Pep Guardiola hailed Manchester City as a team for all seasons as the Premier League leaders survived a stern test at rain-lashed Huddersfield on Sunday. Guardiola's side reestablished an eight-point lead over second-placed Manchester United thanks to a gritty second half fightback at the John Smith's Stadium. Trailing to Nicolas Otamendi's first half own goal, City were in danger of a first defeat of the season against fired-up opponents on a freezing afternoon in Yorkshire. 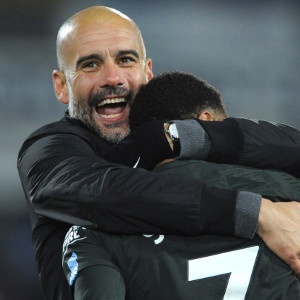 It was exactly the kind of hostile environment that cynics claimed would be Guardiola's downfall when he arrived at City before last season following glittering spells at Barcelona and Bayern Munich. But to Guardiola's delight, City responded to the threat with Sergio Aguero's penalty equaliser and a late Raheem Sterling winner. "The Premier League is so tough, now winter has come, we knew they were so aggressive so strong, but we are so happy for the way we won," Guardiola said. "We spoke at half-time about how to react, we had enough chances to score and the first time Huddersfield had a chance they scored. We spoke about not giving up, to keep going." It was a milestone victory for City, who are the first team to claim 37 points from their opening 13 Premier League games. City have won their last 18 games in all competitions and are unbeaten in their last 26 matches. For the first time in 22 years, they won an away Premier League win after trailing at half-time - securing a club record 11th successive away win in all competitions. City are firm favourites to win the title after Guardiola went without a trophy for the first time in his managerial career last season. The Spaniard admits City are made of the right stuff to last the pace. "It is impossible to win every game easily, this league is so tough. They guys competed amazingly, which is why we won," he said.